Custom Designing & Engineering (CD&E) is a full service MEP (Mechanical, Electrical & Plumbing) design and engineering firm located in Rockaway, NJ. The diversified staff of CD&E, with a total of almost 100 years of experience in the engineering field, is well equipped to give each project, large or small, the individual attention it deserves. Since established, the firm has continually proven its reputation of completing projects using creative and innovative approaches within reasonable time schedules and with extraordinary client satisfaction. Custom Designing & Engineering is committed to providing exceptional in-house MEP design and engineering services to our partners across the United States. With years of design expertise, the staff of CD&E excels at providing timely and accurate design and engineering services for commercial buildings, health care facilities, government buildings, educational buildings, corporate buildings, industrial buildings, retail tenant fit outs, shopping centers, restaurants, places of worship, libraries, theaters, hotels, and multi-unit dwellings. CD&E maintains Professional Engineering licenses in 45 states and the District of Columbia. CD&E also features a LEED Accredited Professional who is experienced in applying sustainable “green” designs to new construction or renovation projects utilizing the most modern equipment and applications. CD&E also features a City of Chicago Registered Energy Professional (Commercial & Residential). 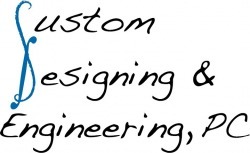 The staff of Custom Designing & Engineering is committed to the belief that maintaining a positive and informative working relationship with our partners is essential to servicing the needs of the client. Through effective communication, carefully conceived and coordinated designs, and accurate, detailed plans, CD&E provides our partners with the service they expect from their engineering design professionals. Our commitment to customer loyalty and satisfaction is acknowledged by those we work closest with. 100% repeat business rate !!! Every single architectural firm that has worked with Custom Designing & Engineering has returned to award additional projects.